that comes, now and again? A friend sent me this poem tonite. She did not know that today was the one year anniversary of my father’s death. Or that a week ago today I was driving the familiar highway to High Point, returning home this time not to say goodbye to my mother, or to dig deeper into excavating the closets and drawers she left behind, but to dig deeper into grief. To go even closer to it — its imposing granite face, its harsh pitch and steep, ragged terrain. My first love and long time friend and his spirited 16 year old daughter were killed in a car accident last week — at nearly the same moment the earth shook in Richmond. A seismic heart-rending, a shifting of emotional tectonic plates, a rift in the Earth underfoot — the known and beloved ground. Stu-bob with his signature gap-toothed grin, and Emma, with her Tootsie Roll-brown eyes and Energizer smile, gone. Mary Oliver, as usual, got it right: it’s too much to carry, but also too much to put down. 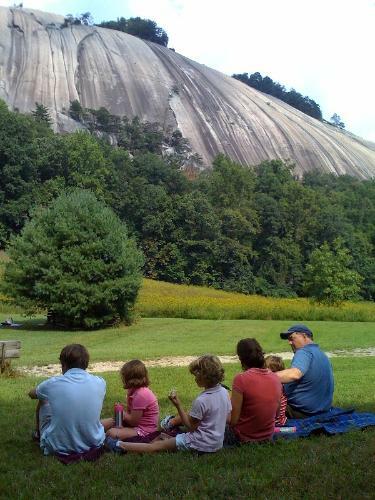 I cannot relinquish my heavy sorrow for Stuart’s family, for his beautiful, gracious wife and the three precious young children and older son he leaves behind, pictured above with their sister and dad last summer at Stone Mountain — a massive granite outcropping in the shadow of the Blue Ridge mountains. I don’t want to put down my own tender memories of summer weekends 30 years ago, when Stu would visit me at a camp overlooking this very same mountain. I can’t stop singing the affirming, gentle refrain the congregation of 1000 mourners chanted repeatedly to set the tone for Emma’s memorial service — I can hear the brush of angel’s wings / I see glory on each face / surely the presence of the Lord is in this place. Like Mary Oliver, I am bent. And I linger — in waterfalls of memory, below mountains of grief, and yes, too, in startling laughter and in the warmth, joy and hugely generous love that will always be Stuart and Emma. ~ by Stephanie on 09/02/2011. “it’s how you carry it.. .” If that is so, then I can say you carry it with honesty, humility, and grace. You carry your year of sorrows in such a way that the rest of us want to stand close, just to be near, to be opened up, too. And to learn to hold it with you. I am shaken to the ground by this piece, and by the light that shines through it. Thank you for bringing us to Stuart and Emma, your father, your mother, and yourself, shaped by grief and love. I don’t know what to say. It’s unending — this sorrow and grief and terrible, terrible tragedy. I am so sorry. That you are able to write so close to it, to the sorrow is amazing, a thing of grace. I send you love. Thanks Steph, he was the most “loveable” person that I have ever known. The only way for me to properly memorialize him is to be more like him: less complaining and more optimism. We should all strive to be as loveable as Stu Bob. Your words are poetic and inspirational. I’m grateful for having stumbled upon your blog and intend to share the good news.